After the US announced it had sent in Special Forces to assist Manila in its fight against Islamist militants, Philippines President Rodrigo Duterte claimed that he never asked for the help. Following a US embassy announcement on Saturday that Pentagon Special Forces would provide non-combat logistical military support to the beleaguered Philippine Army in their desperate fight against extremist militias in the country's south, Filipino President Rodrigo Duterte claimed on Sunday that he did not ask for the assistance. Duterte told reporters on Sunday that he "never approached America" for military assistance and was "not aware of that until they arrived," according to a Reuters report. 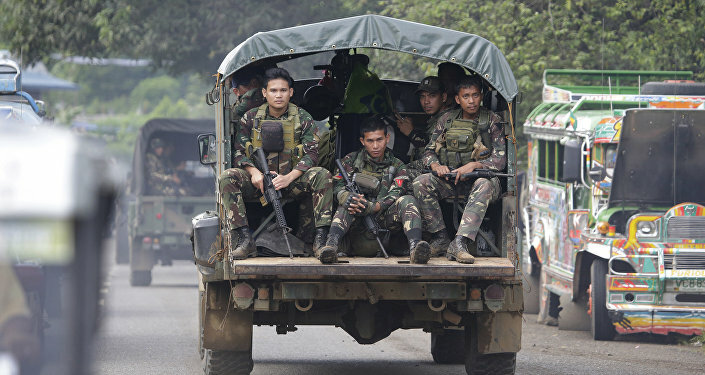 Manila's army is locked in a desperate struggle to dislodge an armed Islamist rebellion allied with Daesh that began on May 23 on the large southern island of Mindanao. Duterte has refuted the long-term alliance between Washington and Manila, going so far as to call former US president Barack Obama a "son of a whore," vowing to close US bases in the island archipelago, and claiming that Russia and China will provide the only military and financial assistance his country needs. But the question remains as to how US Special Forces teams gained local authorization to join the fight, indicating that Filipino military assets made the call, and did so behind Duterte's back. A spokesperson for the Philippines military asserted on Saturday that US military forces were providing logistical and reconnaissance support, but have no "boots on the ground," according to Reuters, confirming a Pentagon statement that US involvement in the fight was requested by an unnamed agency within Duterte's government. A statement from within Duterte's administration noted that US forces are prohibited from engaging in combat in the country, adding, however, that "The fight against terrorism […] is not only the concern of the Philippines or the United States but it is a concern of many nations around the world." "The Philippines is open to assistance from other countries if they offer it," according to the statement, cited by Reuters. Duterte declared martial law in Mindanao after Islamist fighters allied with Daesh seized the town of Marawi. The president claimed that under Philippines martial law he can control the country's military. What’s Behind Duterte’s Declaration of Martial Law in the Philippines? The Filipino president did not comment on allegations that Philippines military officials bypassed his authority to request assistance from US Special Forces, instead remarking that, "our soldiers are pro-American, that I cannot deny." Some 300 have been killed in the fighting, including militants, Philippine army fighters and civilians. An estimated 250,000 people have been displaced in the ongoing battles.